Saving for retirement is critical and investing those assets efficiently is important. However, that is not the end of worries for retirement savings. When you retire, you have a new problem to be concerned with: how much can you withdraw each year without running out of money. It is not a game, there is no one set of retirement withdrawal rules that can apply to everyone. The common rule of thumb has been for retirees to withdraw 4 percent each year — adjusting for inflation as you go along. This rule is supposed to guarantee 30 years of withdrawals. So if you have $1,000,000 in savings, you should be able to withdraw $40,000 in your first year. However, the 4 percent rule was created when investment returns were commonly at 8 percent or higher — not the 3-4 percent that most investment portfolios earn today. Keep reading to learn why you might want to avoid the 4 percent rule and get ideas for better guidelines to follow. The following is explained by Henry K. “Bud” Hebeler, a NewRetirement advisor and often published expert on retirement planning. The common interpretation of the 4 percent rule means a first year withdrawal of 4 percent of the beginning balance. Thereafter, that amount is increased by last year’s inflation. On the other hand, some people use a withdrawal equal to 4 percent of each year’s previous balance—every year. This overcomes the market collapse and emergency draw problems. It also means that savings will last beyond death, but the withdrawals may be very small. The differences between these 4 percent rule interpretations has a huge effect on retirees’ future income and when they may effectively run out of savings. When savings are in a qualified plan like a 401(k), 403(b), IRS, etc., there are IRS rules for required minimum withdrawals (RMDs) from IRS Publication 590. These are mandatory after age 70 ½ or at earlier ages if inherited. The withdrawal is the end of last year’s balance divided by the Required Minimum Distribution (RMD) factor. See Figure 1. It’s important to consider how the different 4 percent and RMD rules behave in real world situations. 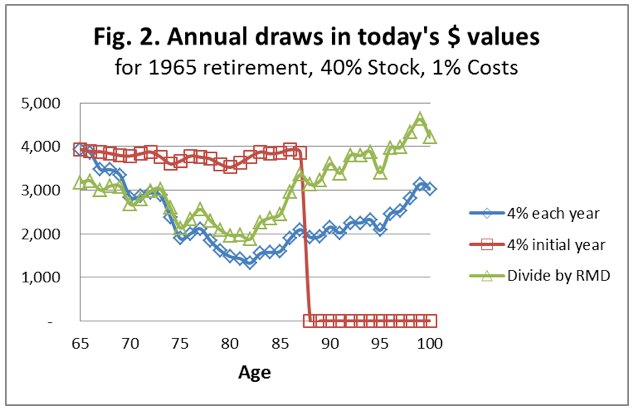 Figure 2 compares those results for a 65 year old who would have retired with $100,000 savings in the difficult period following 1965. It assumes a conservative portfolio with 1% costs, 40% S&P 500 stocks, 50% AAA corporate bonds, and 10% money markets. As you can see, there is no perfect planning method in the real world of varying market prices. Worse may be the surprise events that can take big chunks of savings. 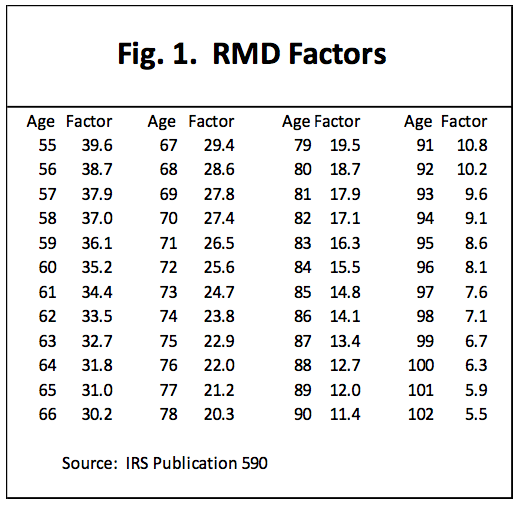 Generally, the RMD calculation will give lower withdrawals than other planning methods. In the few cases where another retirement rule would call for smaller withdrawals, it may still be mandatory to take the RMD withdrawal, but part of it can be reinvested in order not to exceed the preferred smaller withdrawal. I much prefer to do a completely new analysis each year using a comprehensive planning program that can account for downsizing of a home, life insurance, long-term-care, set-asides for large maintenance projects, and consideration of survivor benefits for early or late deaths. I have shown that there is a simple way to help smooth out year-to-year changes in withdrawals by marrying a comprehensive analysis with a simple inflation adjustment in an article on The Wall Street Journal’s Market Watch: http://www.marketwatch.com/story/theres-a-better-way-to-plan-retirement-withdrawals-2015-01-13. Just add ¾ of a completely new conservative computation to ¼ of last year’s withdrawal increased by last year’s inflation. Then you can have a much steadier retirement income though it still may fade at older ages. Knowing how much money you can withdraw from your retirement savings each year, without running out of money, is critical for a secure and happy retirement. However, the amount you can safely withdraw is impacted by a multitude of factors, including: your time horizon (when do you start withdrawing and how long do you need the savings to last) as well as how your assets are invested and how your investments perform. 2) You can also forget withdrawals and focus instead on retirement income. 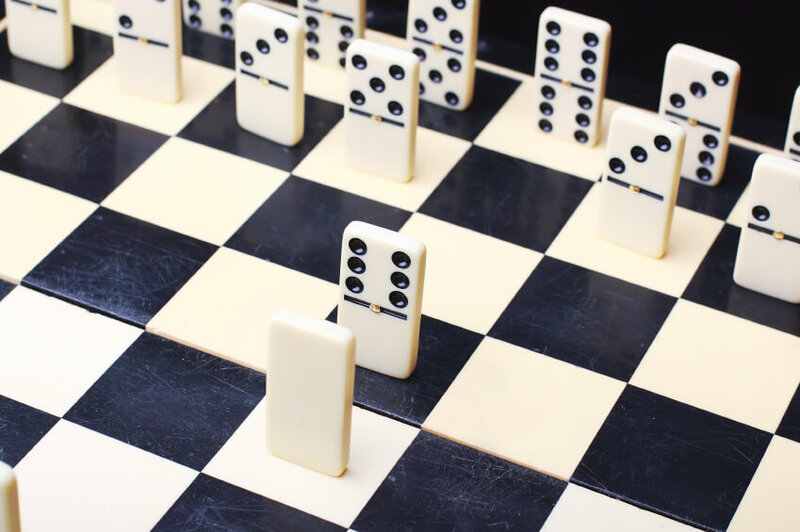 You can figure out how much income you need for retirement and make moves to insure that you receive that income for as long as you live — no matter how long that might be. 3) No matter your initial strategy, reassess every year. The NewRetirement Retirement Calculator lets you make these adjustments and you can see the impact of your changes or changes in the financial markets. Why use the difficult period after 1965??? 401’s didn’t exist then and that economy has little relevance to today. Manufacturing based vs. Information based. A better example would be after 1992 that includes the .com crash, the 2005 crash, the 2008 “great” recession. Also the assumption of mix of investments for the longevity of retirement is out of whack with today’s long lived retirees.